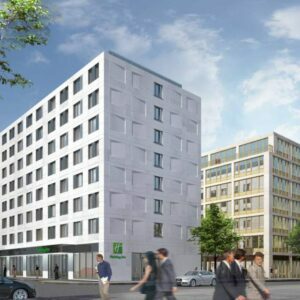 Europe’s first music hotel is located directly on the banks of the River Spree and in the epicenter of Berlin’s music, fashion and creative scene. No one less than New York designer Karim Rashid designed the entire interior of nhow Berlin. His visionary designs form a perfect symbiosis with the achievements of star architect Sergei Tchoban. As a Gesamtkunstwerk, nhow Berlin is a modern architectural and design highlight of the capital. Business travelers Cosmopolitans, international jet setters and hip bands meet here. What unites everyone is the love of music. An in-house music manager, an exclusive guitar room service and a high-end recording studio with panoramic views over Berlin, operated in cooperation with the legendary Berliner Hansa Studios, scream out loud, which is whispered elsewhere. The Spree is just outside the door, the city center is only a few minutes away by S-Bahn and the O2 World Berlin can be reached on foot. Short distances to all sights and excellent public transport links are as pleasing a feature of the ibis hotel as the 242 modern and air-conditioned rooms. The hotel also has free Wi-Fi, very comfortable beds and a private underground car park. Directly opposite, on the other side of the Schillingbrücke, is the scene district Kreuzberg, where you can get to know the unique nightlife of Berlin. The Eastern Comfort is the only hostel ship of Berlin and convinces by a noble ambience paired with the charm of an old boat. 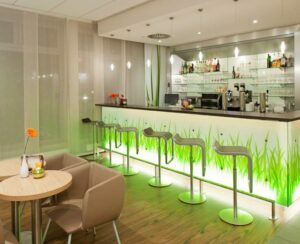 The ship is anchored in the immediate vicinity of the Oberbaumbrücke and thus our event rooms. 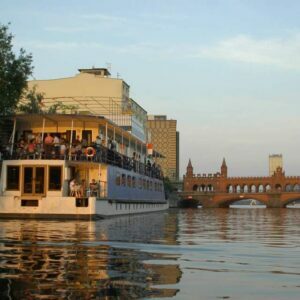 The ship’s own lounge on Oberdeck also guarantees a relaxed end to an exciting day directly on the River Spree in the middle of Friedrichshain. Experience an overnight stay you have never experienced before. 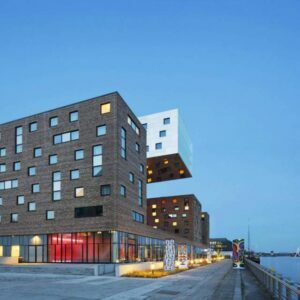 The Eastern Comfort – Berlin’s only floating hostel – looks forward to your booking.